Amazon donates 0.5% of the price of your eligible AmazonSmile purchases to Youth On Their Own. Support Youth On Their Own by starting your shopping at smile.amazon.com. 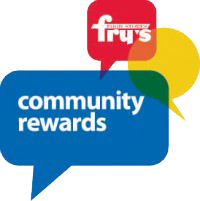 You can support Youth On Their Own each time you shop at Fry’s. To get started, sign up with your V.I.P Card on the Frys website, and select Youth On Their Own as the organization that you would like to support. Once you’re enrolled, you’ll earn rewards for YOTO every time you shop and use your V.I.P Card! Note! If asked to enter a code for Youth On Their Own, please use 27567. CARS is a 501(c)(3) nonprofit that supports more than 1,500 causes across the United States! Donating your vehicle – whether it is running or not – has never been easier. Accepted vehicles include cars, trucks, vans, SUVs, boats, motorcycles, ATVs, RVs, trailers or airplanes. CARS takes care of the entire donation process – from vehicle pickup to the final sale. They provide you with all of the necessary tax deduction receipts and forms within 30 days of the sale. Proceeds from your contribution will support even more homeless youth to stay in school to their graduation. Questions? Call 855-500-7433 to speak to a representative.